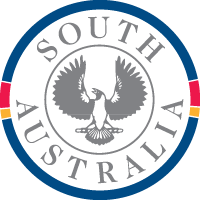 The department assesses applications for the use of state insignia including the South Australian state flag, badge and coat of arms. Under the Unauthorised Documents Act 1916, no one can print, publish or manufacture the symbols without permission, and they cannot be used for commercial purposes. 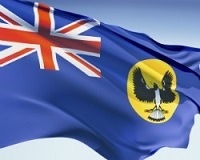 The State Flag, which is flown from government buildings and vessels, was authorised by proclamation on 13 January 1904. It comprises the Blue Ensign, which is the Union Jack in the top left corner (canton) and the blue background, with the State Badge in the fly (area farthest from the flag pole). The State Badge of a piping shrike (also known as a White Backed Magpie), was notified by a proclamation gazetted on 14 January 1904. The original drawing of the piping shrike was done in 1904 by Robert Craig of the School of Arts. A later drawing was done in 1910 by Harry P Gill, who was the Principal of the School of Arts. Blue (Pantone 295), red (Pantone 199) and gold (Pantone 137) were adopted as the official State Colours of South Australia on 25 November 1982. The colours can be used by individuals or organisations without permission. 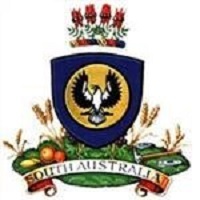 The State Coat of Arms, conferred in a proclamation gazetted on 19 April 1984, replaces an earlier Coat of Arms conferred by King Edward VIII in 1936.
for Arms, Azure on the rising sun depicted as a roundel or an Australian Piping Shrike displayed and standing on the staff of a Gum Tree proper and for the Crest on a wreath or Azure and Gules Four sprigs of Sturt's Desert Pea proper the Shield upon a Compartment comprising a grassy mount and in front of two Vines growing therefrom each entwining their stakes proper on either side thereof stalks of Wheat and Barley and the dexter side scattered with Citrus Fruits and lying on the sinister side two Cog Wheels with between them a Miner's Pick also proper together with on a Scroll the name "South Australia ". Please contact our Protocol Unit for further information about the use of state insignia. The seven state emblems are unique representations of South Australia’s flora, fauna, cloth, geology and marine life. 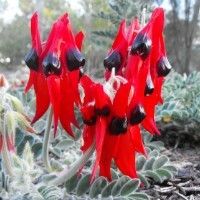 The Sturt’s Desert Pea was adopted as South Australia’s floral emblem on 23 November 1961. 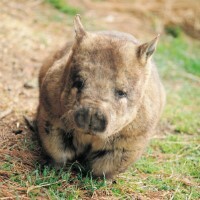 The southern hairy-nosed wombat was adopted as South Australia’s fauna emblem on 27 August 1970. 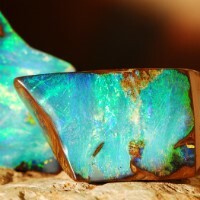 The opal was adopted as South Australia’s gemstone emblem on 15 August 1985. 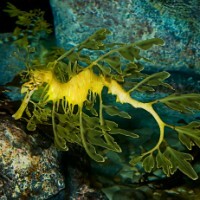 The leafy sea dragon was adopted as South Australia’s marine emblem on 8 February 2001. 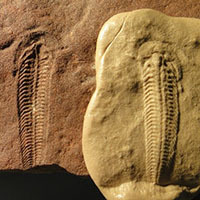 The Spriggina Floundersi was adopted as South Australia’s fossil emblem on 14 February 2017. 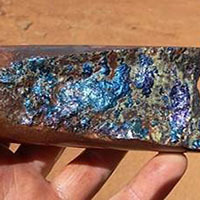 Bornite was adopted and South Australia’s Mineral Emblem Mineral emblem on 28 June 2017. 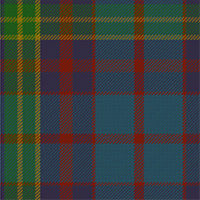 The State Tartan (registration number 2534) was adopted as South Australia’s State Tartan on 20 February 2018.